It may seem a little unusual now but until the passage of the federal income tax via the 16th amendment in 1913 the federal government received almost three quarters of their revenue from alcohol taxes. After the end of the revolutionary war the federal government had racked up something in the order of $54 million in war debt. By 1789 the debt had become a problem and by 1791 the government had found a solution in the form of excise taxes on distilled spirits. This was the first time the government had imposed a tax on domestically produced goods. This was especially hard on farming communities in the “western” part of the country. Whiskey was used to convert excess grain into a cash crop which given the lack of a national currency was a common medium of exchange. 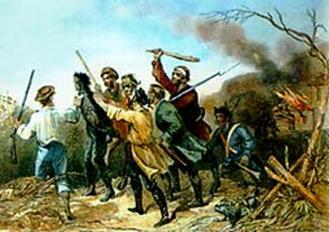 The rebellion started in 1791 with the tarring and feathering of a tax collector. Followed by the murder of a process server, delivering papers to the tax collector’s murderers. Tax offices were burned and the federal response was the brutal suppression of the dissenters. The entire affair can and does occupy several books of history but the end result is that the rebellion failed and many of the people involved left Pennsylvania moving westward and south into what would eventually become Kentucky, Tennessee and the rest of the bourbon belt. All your favorite brands in one way or another owe their existence to those Pennsylvania Rye makers who fought hard to keep their moonshine. Posted in Feature.Tagged bourbon, bourbon heritage month, bourbon history, Pennsylvania rye, whiskey rebellion.